Join local artist Kayla Ellis as she guides you through the process to create the barn quilt of your imagination! 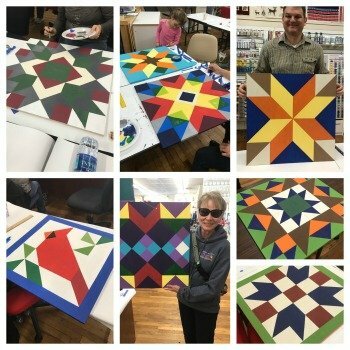 In this painting class, you'll learn to lay out, measure, draw and paint your quilt to take home that afternoon! What a great way to spend the day before Mother's Day-- make it for your mom or bring your mom! Spots are limited, so sign up soon! To be clear, this is a painting class just for fun. It does not involve the use of your sewing machine at all. You don't need to bring a thing, except for lunch!